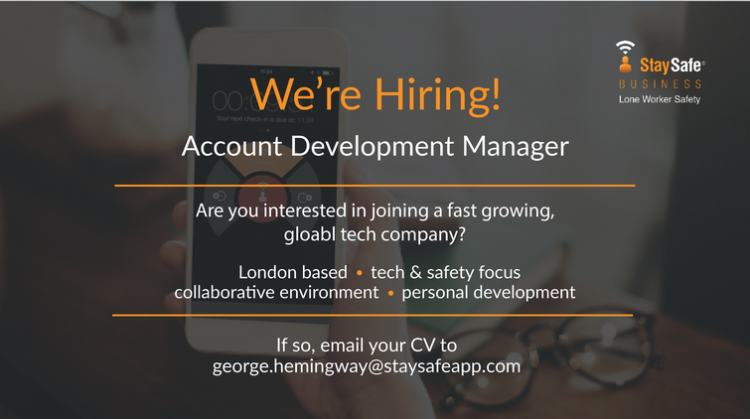 Our young, buzzing tech company operating across 5 continents, is looking for an ambitious Account Development Manager to join our expanding sales team. The incoming Account Development Manager will be passionate about sales, looking after our customers and really willing to learn. The right attitude is far more important to us than experience as the successful candidate will be fully trained and supported on the job – making this the perfect role for recent graduates or those looking for a change. If you are driven, self-motivated, and looking to start a successful career in sales, then this is the perfect opportunity for you. Our innovative, rapidly expanding company has created an app and web-based Hub which looks after lone workers, making sure they are always protected and can signal for help during an emergency. The business is in the midst of a period of rapid growth with a presence in 42 countries across 5 continents and with a huge potential market. To keep up with this growth, the business is looking to employ an ambitious Account Development Manager to tap into the growing client base and help the business smash sales targets. Take this opportunity to advance your career in a young company fostering a collaborative mindset where all ideas are valued. If you are keen on joining this exciting, forward thinking company and taking the next step in your sales career, then please click the apply now button to find out more.